Do a quarter million Swiss secretly eat cats? The facts for the story originated with an animal rights group, SOS-Chats Noiraigue, which is campaigning for legislation to halt the consumption of cats and dogs. Tomi Tomek, the founder of the organization, was quoted as saying, "These animals form part of a family; they must not end up on a dinner plate. Around three per cent of the Swiss secretly eat cat or dog." This is where the "quarter million Swiss" figure comes from, because 3% of the Swiss is around a quarter million people. The claim got a lot of relatively uncritical coverage, repeated by media outlets such as the BBC, Newsweek, the London Times, and the Washington Post. But subsequent investigation has cast some doubt on it. No one actually denies that cat eating was once a tradition in rural Switzerland (as it used to be in other parts of Europe as well), and that a handful of people may continue the practice. But when reporter Helena Horton asked SOS Chats where they found that 3%-eat-cats statistic, they confessed that they didn't know where it came from. In other words, it appears they made it up. And if you think about it, how could such a figure possibly be obtained if the cat and dog eating is being done secretly? As the proud owner of the first Great Swiss Mountain dog to come to New Zealand, I take exception to the unfounded assertion that 240,000 Swiss or 3 per cent of our population indulge in the despicable habit of consuming pet meat (Swiss asked to stop eating their pets, November 28). This story has been invented by an animal rights extremist and made it into London's The Times newspaper. 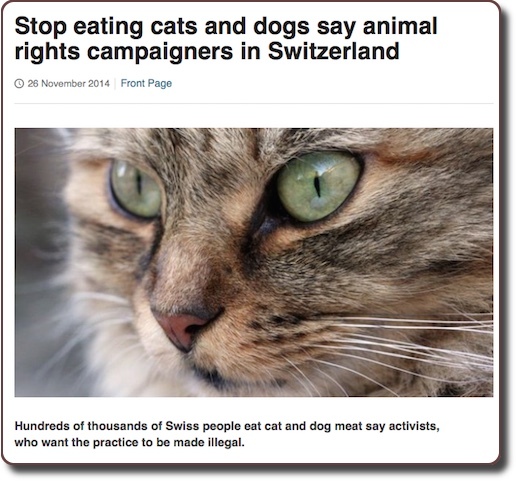 Here are the facts: selling, buying or trading cat or dog meat is illegal in Switzerland. In any country, some primitive individuals may eat their own or stolen pets, but I categorically state that this is not at all a widespread Swiss habit and that the 3 per cent (that would make 130,000 Kiwis) are totally made up. Just like New Zealanders, we Swiss love our cats and dogs and are proud of our native breeds, among them the well-known Bernese Mountain Dogs and St Bernards. As for the ''wife of a Swiss ambassador'' who, according to the article, explained the disgusting habit with the ''high price of Swiss meat'', this person does not exist. I have checked. All in all, it doesn't look like there's much reason (if any) to believe that a quarter million Swiss people eat cats and dogs. However, this case does demonstrate how easy it is to get media coverage simply by inventing a shocking statistic.